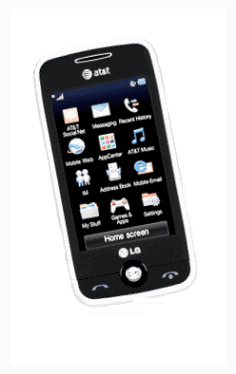 The LG Prime GoPhone was perhaps the best and most affordable prepaid touchscreen phone available when it was released. It cost $99.99 (including a $15 airtime card)from AT&T and $79.99 from Amazon where it got some great reviews. OK, if you want an affordable touchscreen phone, this is (was) one of your best options. The touchscreen is a standard pressure sensitive type and not like what is on the iPhone. It seems to work pretty well, however, as most people seem happy with it. If you do get it, you may want to protect the screen. For a couple of bucks, you can get a packet of Screen Protectors that will keep your screen in great condition. With its nice big screen, the phone is a nice way to look at your pictures, whether sent to you by a friend or taken with the camera. The 2.0 megapixel camera should give you some good pictures. I find that once you get to 2 megapixels, whether you like the picture depends on the subject of the photo rather than any technical details. Two megapixel takes up a full screen on many computers and is good enough for making small prints. The camera takes and plays small videos as well. The LG Prime features a music player capable of playing these music formats: AAC, AAC+, MP3, and WMA. Can you play your music from iTunes? iTunes come in the AAC formats so this phone should be capable of playing those tracks. Some people have reported some difficulty, however. My guess is that since this is not an official iTunes device, there is a permissions problem. You can probably solve this problem my making sure the iTunes song is a “DRM-free” track. I think you have to pay a few cents more when you buy a DRM-free track from iTunes. The phone has 48 MB of internal memory, but you can add up to a 16 GB microSD-size card. As for what brand. AT&T appears to favor SanDisk, as that is what is available on its site, but most of the familiar brands should be okay. When you don’t feel like playing just your own music, you have a couple of other options. You can listen to FM radio stations. You can also sign up for an AT&T Mobile Music subscription. There is a free trial, but after that it costs $7.49 a month or about $96 a year. You get access to 40 commercial-free radio stations, and you can set up 50 personal radio stations. You can also buy additional songs. You can surf the web with your LG Prime. This is not a 3g phone, however, so you don’t get high-speed downloads. Still, for viewing informational web pages, it should be fine. You can check your email. You can get on Facebook, Myspace and Twitter and keep up with all your friends. For example, you can update your status view your alerts on all these services. Of course, your communication on this phone may be more standard. Customers, generally have been positive about the call quality on this phone. You can view your text messages in either threaded conversational mode or standard mode. You are apparently limited to storing 300 messages in the internal memory, but you can easily add a memory card. Almost everyone agrees that the LG Prime Gophone, when it was introduced, was one of the best prepaid cell phones ever offered, but some customer had consistently mentioned that the phone screen “locks” just two seconds after an incoming call is received. People have tried to change the locking period to try and lengthen this time, but it doesn’t seem to work. On the surface, this seems like a big problem. Why would LG make the Prime lock just two seconds after receiving a call? It turns out, the phone locks so that you don’t accidentally activate any features while you hold the touchscreen phone against your face while you’re making your call! This was a complaint from some LG Neon users, and so this is how the problem was solved for this phone. Even better, you can easily unlock the screen with just one press of a button on the side of the phone. With this issue solved, all you’re left with are the phone’s great features. If you get the LG Prime GoPhone or any AT&T prepaid touchscreen phone, online, you can take advantage of free shipping and free online activation. If you already have a GoPhone, note that you can transfer your SIM card and still receive your free airtime by following the instructions on the package. Here are a few more touchscreen phones that you may want to consider. The 840g is also made by LG and has WiFi capability. The display is also a real touchscreen unlike the pressure-sensitive screen on the Prime. On the other hand, the EX124g from Motorola not only has a screen that requires pressing, it even includes a rubber-tipped stylus for that purpose.